I enjoy examining old photographs and trying to tease out all the facts I can about the subject but sometimes the full meaning of what is going on eludes me. Today I came across an image that I just can’t seem to figure out…perhaps you will have a suggestion as to its content. 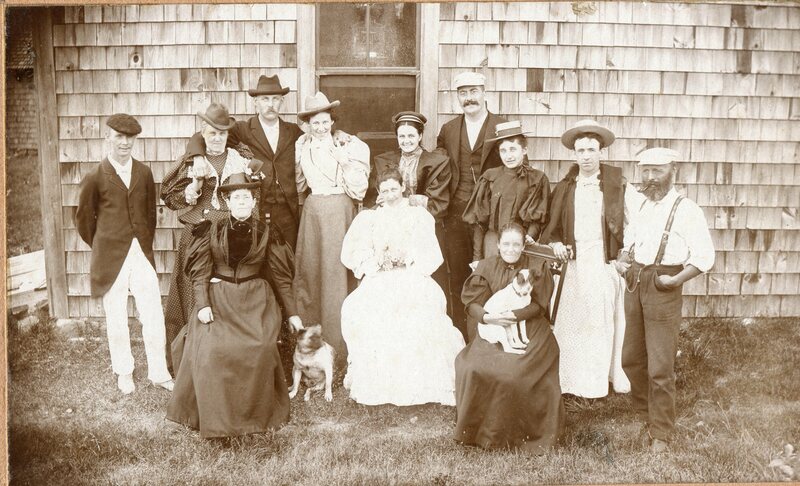 The image is of a Duxbury, MA gathering. The man on the far right smoking a pipe is George Ellis Hathaway (1851-1944), the grandson of the painter, Rufus Hathaway. George lived at 95 West Street, although the location of the photo is uncertain. The photograph was taken by F. S. Needham of Duxbury. Based on the style of dress on the women (the loose drooping sleeves above the elbow, for example) the photo is c. 1893-1896. I love everything about it – the rich velvet fabric on the shoulders of the woman seated on the left; the pug and jack russell terriers, both blurred in movement; the smiling faces; the hats. It’s all wonderful. I wish I could identify everyone and maybe with a bit more investigation, I will be able to put names to at least one or two more individuals. Have you spotted my real dilemma yet? Take a close look…closer…closer still. Notice the man standing next to George Ellis Hathaway? Yes, that’s the one, the one wearing the dress. I would love to know what is going on there. Are they a group of amateur actors just finishing a performance? There does seem to be a certain amount of playfulness on everyone’s face – except for his. If you have any idea what the true subject of this photograph is or can identify anyone pictured, please let me know. This entry was posted in Uncategorized and tagged cross-dressing, Duxbury, photographs, Rufus Hathaway. Bookmark the permalink.